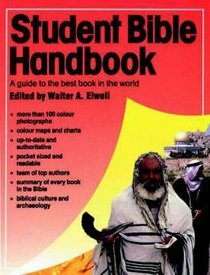 About "The Student Bible Handbook"
Aimed at anyone who would like to know about the Bible, this guide offers information, accompanied by photographs, graphics and diagrams. Walter A. Elwell (Ph.D., University of Edinburgh) is emeritus professor of biblical and theological studies at Wheaton College. He has edited numerous biblical reference works, including the Baker Theological Dictionary of the Bible, The Evangelical Dictionary of Theology and Encountering the New Testament. Most recently he has edited The Hendrickson Topical Bible.